Disc: (4/1960) Black label, dog on top. LIVING STEREO. 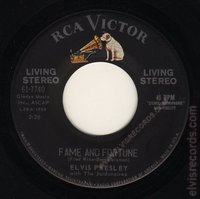 This is the stereo counterpart to the regular issued monaural release as Stuck On You / Fame and Fortune in 1960.